November, in its kindness — how we have waited. There's something about the calm and unassuming nature of November, or maybe it's the prelude to a season of grandiosity and sweet treats, but more likely it's the quietness of the vibrant leaves falling and the snow not quite arrived. Whatever the case, November is handedly our favorite month. Years ago our copy of A Sand County Almanac arrived in the mail with a bookmark depicting a red fox with the words "November is kind" beneath him, like some kind of epitaph. A curious little treasure; a most agreeable epitaph. This month has been particularly bountiful, food-wise. 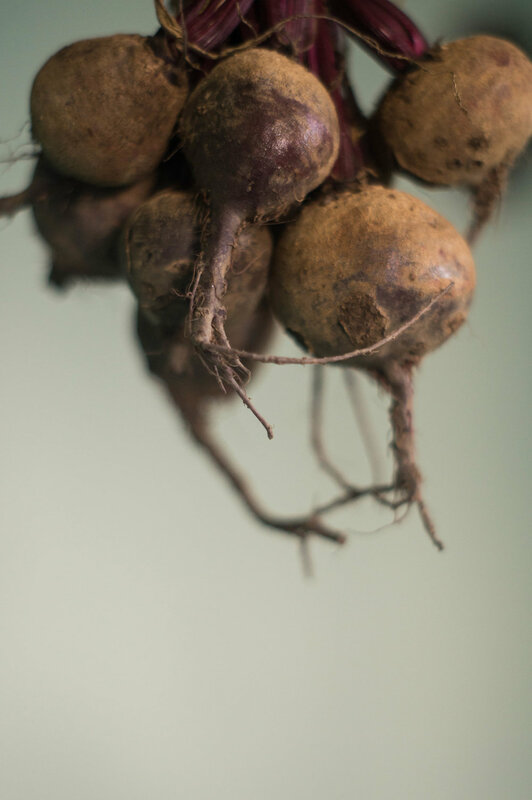 We intend and hope to always have bountiful and healthful food in our larder. Still, the future is unpredictable and we want to pause with gratitude for this year, should there come a time when food like this is sparse. Since returning to Ohio we've had the pleasure of lending our hands on an organic produce + flower farm. The commute is unreasonable at two hours, but the pleasure of working alongside Kristy + Aaron and their crew is wholly worth it; a kind of haven. It's a place that expects much and gives more in return. Days on their farm are suffused with joking and great conversation and reciprocal respect — qualities that seem surprisingly rare on farms (and workplaces in general)! Vegetable farming is back breaking work, and although we do not want to be vegetable farmers ourselves, we are hugely grateful for people like Kristy and Aaron who devote their lives to the pursuit of the Tender Carrot, of the Ripe Tomato, of paving a different (healthier, tastier) road for food consumption and land stewardship. For the black beans, the garlic, the onions, the cabbage and the tomatoes; for this season of kindness and abundance; and for the farmers who work every day to put food on our tables: thank you!